The Finish Kare 1000P Hi-Low Paste Wax contains a blend of synthetic waxes that are good general release agents for epoxies, urethanes, rubbers, acrylics and ceramics. 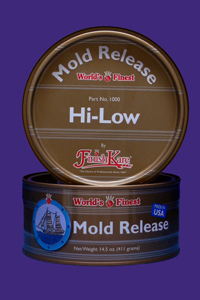 Finish Kare 1000P Hi-Low Paste Wax is also great for applying to wood boxes to keep silicone from sticking. Finish Kare 1000P Hi-Low Paste Wax is fully synthetic and not subject to the quality fluctuations so often found in natural organic waxes such as carnauba. Because of its’ synthetic nature the resulting film, upon proper application, has high gloss, extreme slickness and intensive wear. It is also resistant to high exotherms (to 275º F or 135º C) and water. This will assure you of consistent easy de-molding. Finish Kare 1000P Hi-Low Paste Wax is available both in individual cans and in cases of 12 cans. This entry was posted in Blog, Mold Release and tagged finishkare 1000p.